There are echoes of history in all this. Echoes that remind us in one way or the other of Berlin. China's Olympic extravaganza -- and its suppression of dissent -- inevitably remind us of Adolf Hitler's Berlin Olympics in 1936. Russia's torrent of lies -- its claims that democratic Georgia has been engaged in ethnic cleansing, its claims that it is acting in the interest of Russian citizens, its claims that it has accepted a ceasefire when its tanks continue to enter Georgian cities -- remind us of Hitler's claims that Czechoslovakia was oppressing the Sudeten Germans and his claims that Poland was committing atrocities before he invaded. Belatedly, on Aug. 13, George W. Bush reminded us once again of Berlin, when he announced that the United States would airlift supplies and send Secretary of State Condoleezza Rice to Georgia. The United States has no capacity to join Georgia in arms and does not want a direct military confrontation with Russia. But in effect we are putting feet on the ground in Tbilisi and its airport, which should make it plain to Putin that an assault on them is an attack on the United States. There's a parallel here to the situation in Berlin in June 1948, when the Soviets cut off land access to West Berlin. Harry Truman's top civilian and military advisers told him there was no way to supply the city by air and that we could not win a land war with the Soviets. But Truman said, "We're staying in Berlin," and the American military made the airlift work. The Soviets could have wiped out the Allied garrison, but they dared not do so. For the full story of the airlift, read Andrei Cherny's riveting "The Candy Bombers." John McCain has taken a strong stand from the start. His statement, "We are all Georgians," echoes John F. Kennedy's "Ich bin ein Berliner." Barack Obama, after a weak opening statement, has also condemned the Russian actions. But his own speech before the Prussian Victory Column in Berlin showed an incomplete appreciation of history. He hailed the Berlin airlift as an example of American generosity, which it was. But he didn't note that it was an example of American military strength: The "candy bombers" were members of the U.S. Air Force. And when he celebrated the fall of the Berlin Wall, he said it was supported by "the world as one." But a lot of people -- communists -- built the Berlin Wall, supported the Berlin Wall and shot men who attempted to climb over the Berlin Wall to freedom. Vladimir Putin's Russia did not invade Georgia solely because it is a country on its borders moving toward freedom, democracy and the rule of law, though that was one reason. He did not invade solely to intimidate other former Soviet republics that have moved in the same direction -- Ukraine, Lithuania, Latvia, Estonia -- though that was another reason. He invaded also because Georgia is the chokepoint on the Baku-Tbilisi-Ceyhan oil pipeline that is the sole means except through Russia of transporting oil from the Caucasus and potentially natural gas from Central Asia to Europe and the wider world. 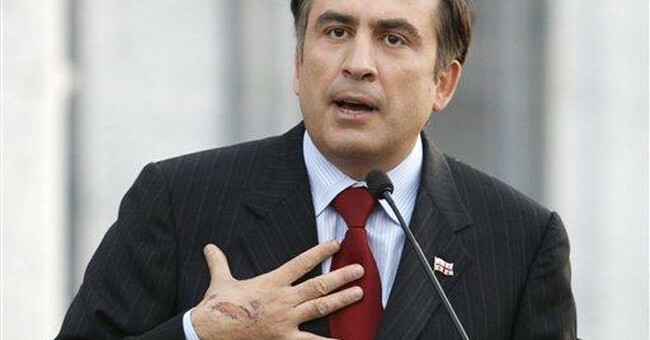 Maintaining a visible and active American presence in Tbilisi makes it riskier for the Russians to destroy the pipeline and makes it easier for Georgia's President Mikheil Saakashvili to resist Russian pressure to resign. There are other ways we can put pressure on Putin: Charles Krauthammer has suggested dissolving the NATO-Russia Council, barring Russia from the World Trade Organization, dissolving the G-8 and boycotting the 2014 Winter Olympics. The way forward is not clear, as it was not in Berlin in 1948. Some say we never should have encouraged Georgia by offering NATO membership, which was sidetracked by Germany; others say if NATO membership had been extended, Russia would not have invaded. Perhaps and perhaps. In June 1948, some said we should have withdrawn from Berlin, while others said we should have negotiated land access to Berlin in 1945. We are where we are, as we were where we were then. The question is whether we have the nerve and the ingenuity and the persistence to stay. Truman's America did. Does ours?